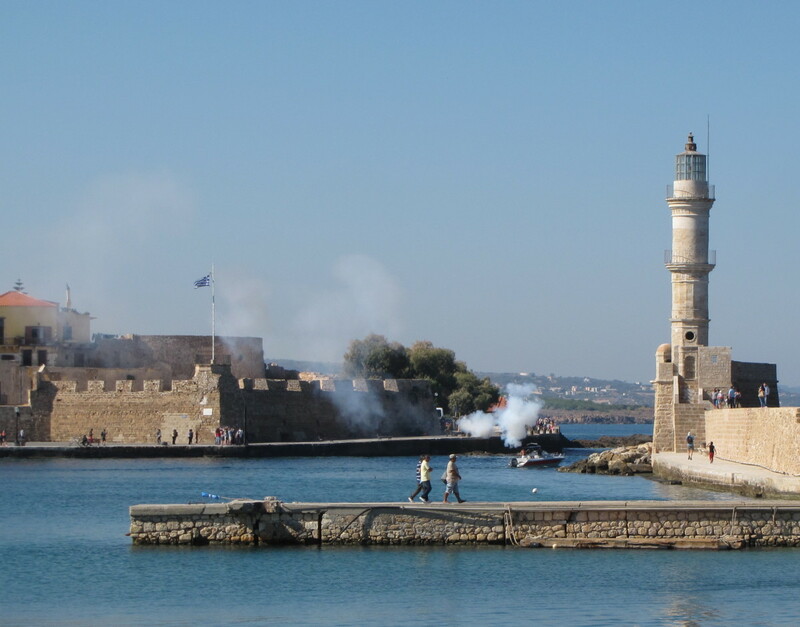 A recent cruise through the eastern Mediterranean took us to the beautiful Greek Island of Crete. For those of you not familiar with Crete, it is the largest and most populated of the Greek Islands. It sits at the southern end of the Aegean Sea and the island measures approximately 160 miles long by about 35 miles wide. The island is unique in that it is actually very mountainous and has peaks that rise to over 8,000 feet. 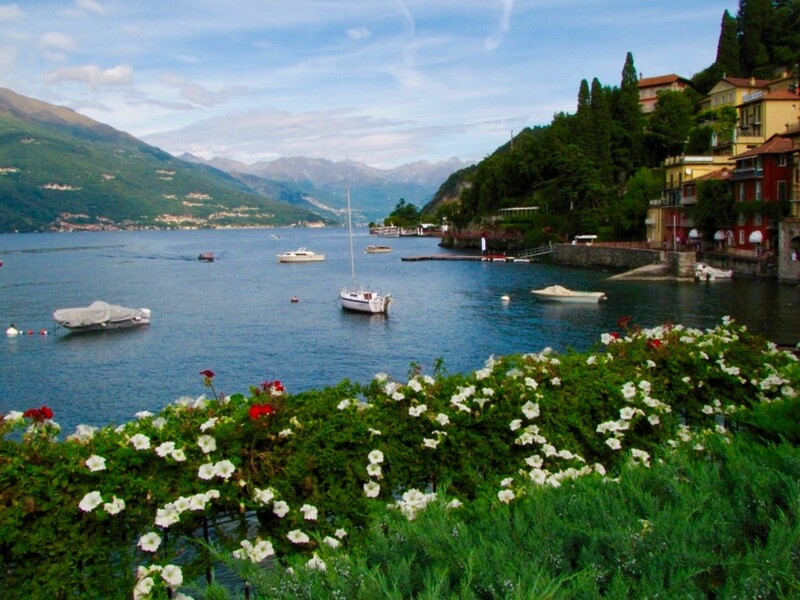 Visiting such a large island as part of a cruise means that you will be very limited as to what you can see in just one day. With this in mind we decided to visit the Old Town of Chania, which is considered to be one of the most beautiful and historical areas on the island. Chania is the second largest city on Crete behind Heraklion, which is also the capital of Crete. The port that services Chania is Souda and it is located about four miles to the east of Chania. 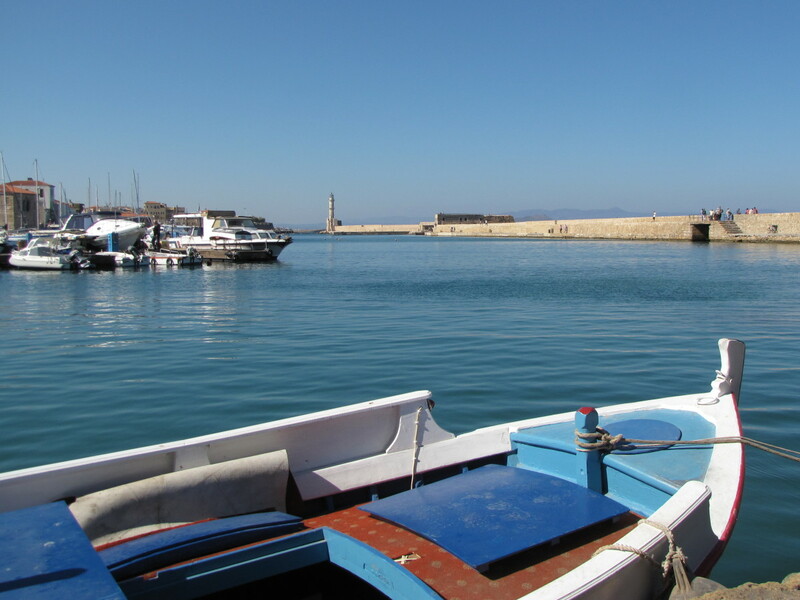 A quick bus ride had us exploring the narrow alleys and beautiful waterfront of Old Chania in just minutes. If you are considering attempting to walk from the port to Chania I would not recommend this. The route is twisting with many turns and is heavily travelled in areas with vehicles taking visitors to and from the port to town. The bus trip was just a few euros and took approximately fifteen minutes to make the trip. A little perspective on Chania is appropriate here so you will know what to expect when you arrive. 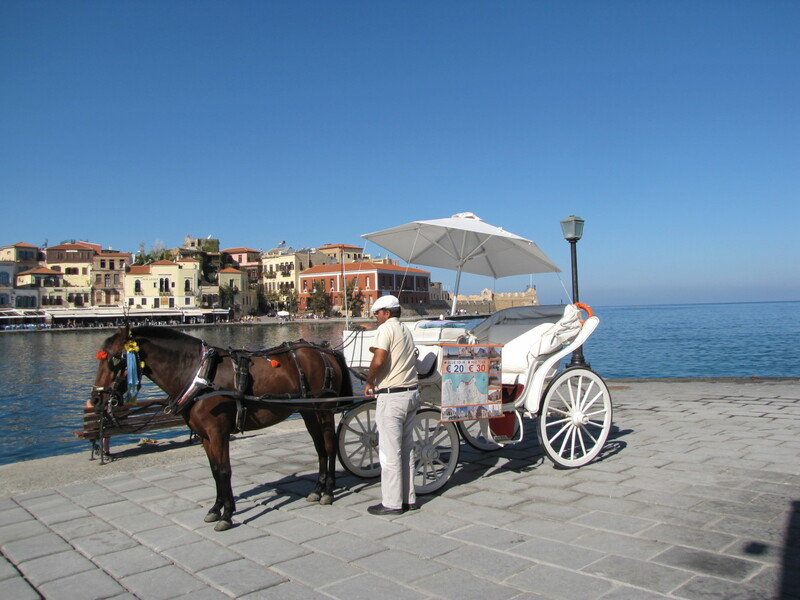 First of all Chania is very old and dates back to the early Minoan settlements on Crete. This puts Chania on the map as far back as a few thousand years BC. 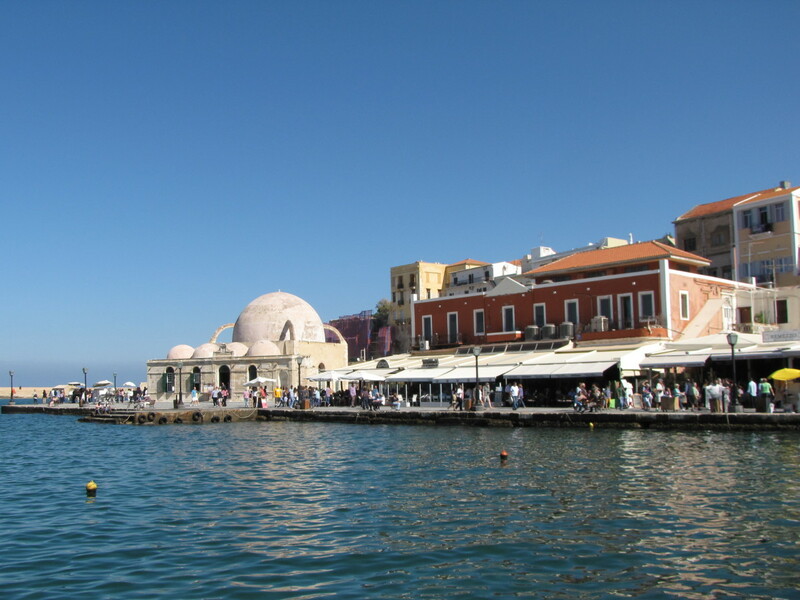 The community of Chania is a blend of Greek, Venetian and Turkish cultures, which makes for a fascinating experience. As is common with most Mediterranean Islands, Crete changed hands numerous times over the millennium and after the period of the Crusades wound up being controlled by the Venetians in the 13th century. 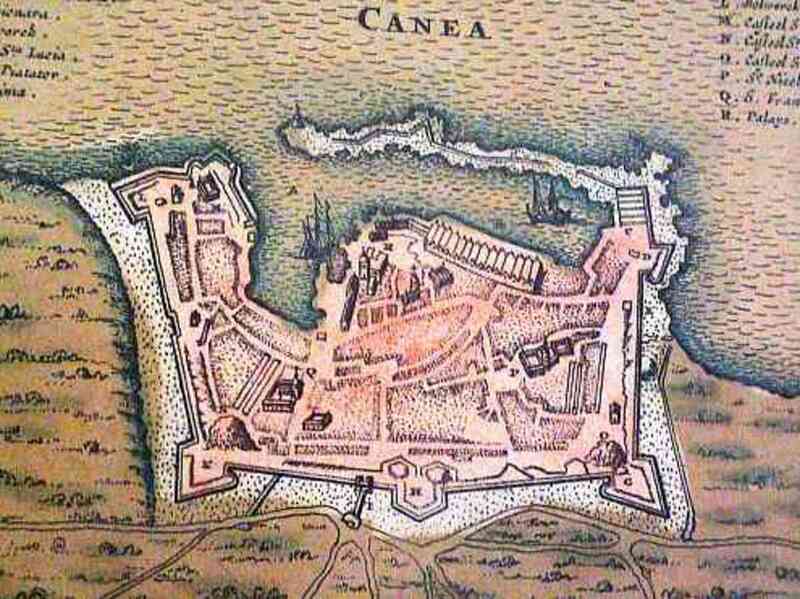 For the next few hundred years the Venetians fortified the city and built the “Wall” that at one time surrounded Old Chania. Most of the wall is gone today but a few remnants do remain. 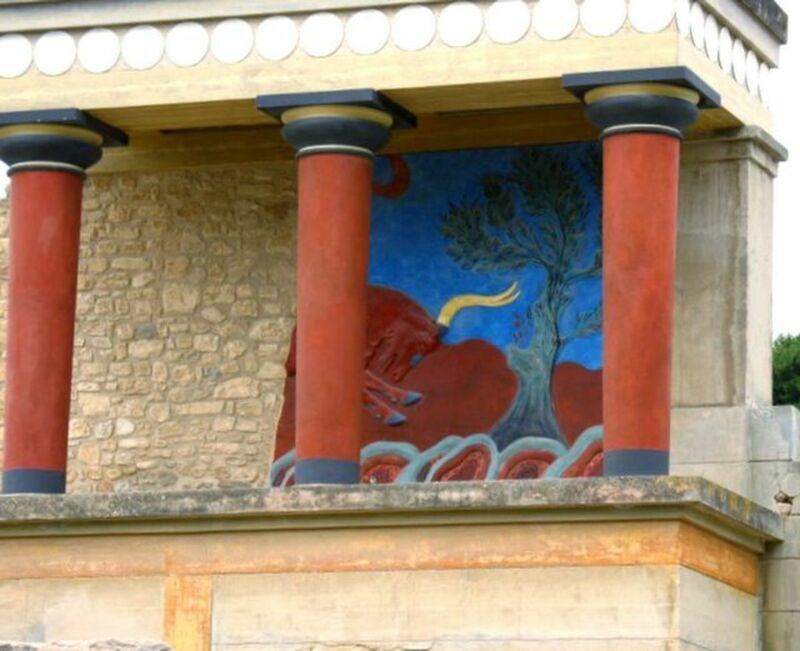 The Minoan civilization arose on the Greek island of Crete and is widely considered to be the earliest European culture dating back to the 27th century BC. Some historians think that the catastrophic eruption on the nearby island of Santorini may have caused the demise of the Minoan culture on Crete. In the early to mid-17th century the Ottoman Empire was expanding through the Mediterranean region and Crete was overrun by the Turks in 1645 after a two-month siege. Many of the churches were converted into mosques and a Turkish culture took hold of the community. By the 1800s the Greek population of Crete was rebelling against the Ottoman Empire and eventually Crete moved toward independence and reunification with Greece in 1913. Crete suffered greatly during the German occupation of World War II and most of the Jewish population of Chania was either executed by the Germans for participating in the resistance, or died when a German ship carrying them off to concentration camps was sunk by the British. It took years for Crete to recover from World War II, but by the 1970s it was clear that Crete’s future would be as a tourist destination. With a construction boom and a new airport, Crete quickly became a favorite holiday location for Europeans. Today the ancient community of Chania is a very popular stop on the Mediterranean cruise circuit and this fuels the local economy. 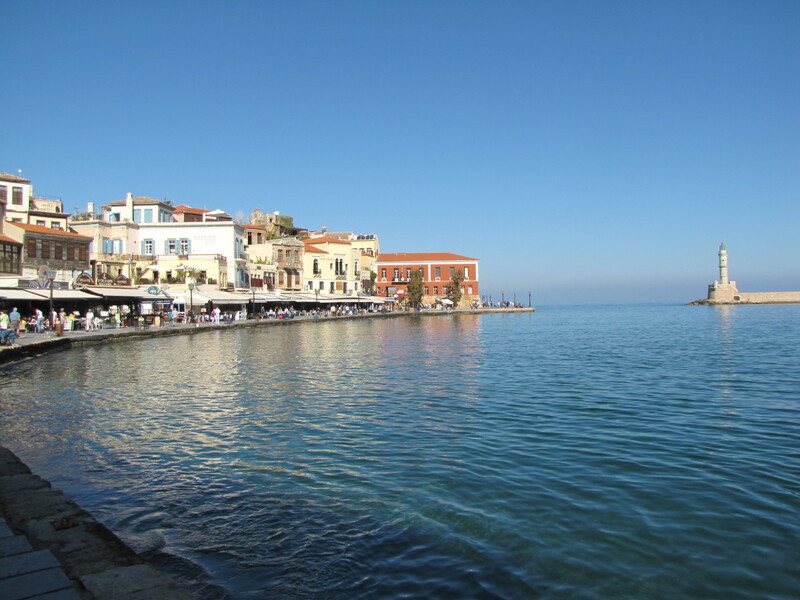 Our plan for the day in Chania was to simply explore the Old Town with a few specific sites to stop at mixed in. The old section of Chania is very walkable and the waterfront area is lively, colorful, and makes for a pleasant and interesting visit. Maps of the town are readily available either on-line or at any shop in town and we found it helpful to have one when exploring the narrow back alleys of Chania. 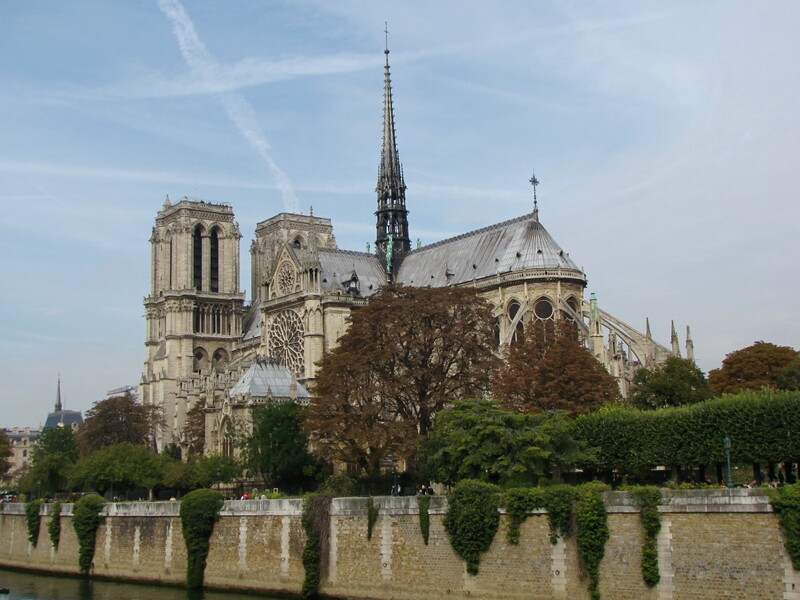 While we were able to see most of the sites that we wanted to visit we did not have time to visit everything. 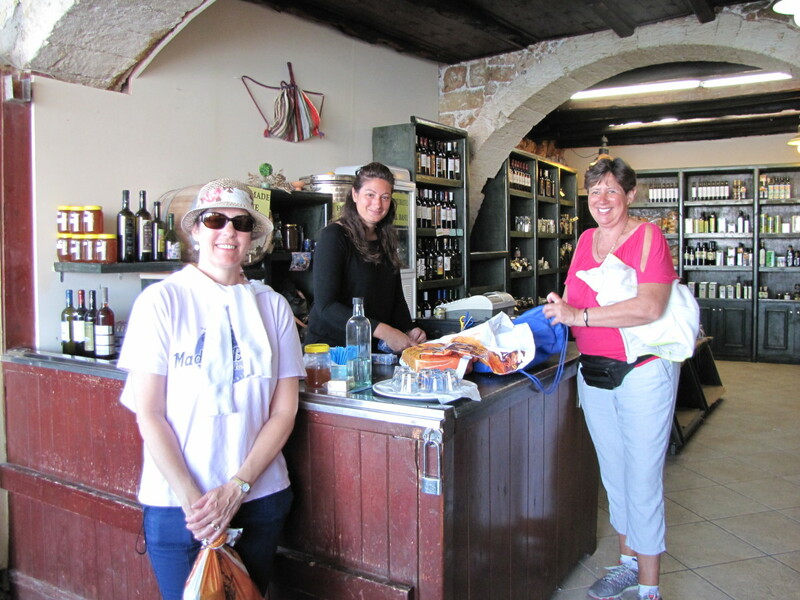 Some of the highlights of our day in Chania are discussed here. 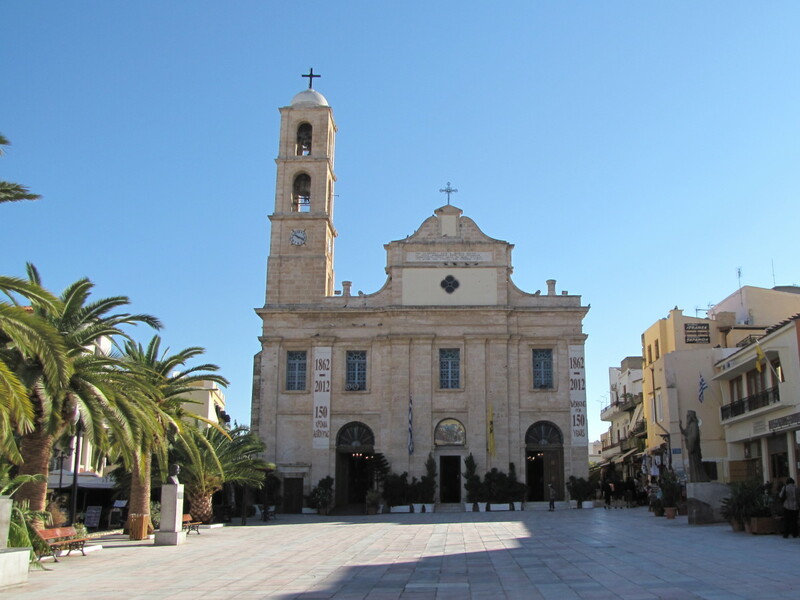 The Greek Orthodox Cathedral of Chania is known locally as the church of the Three Martyrs. 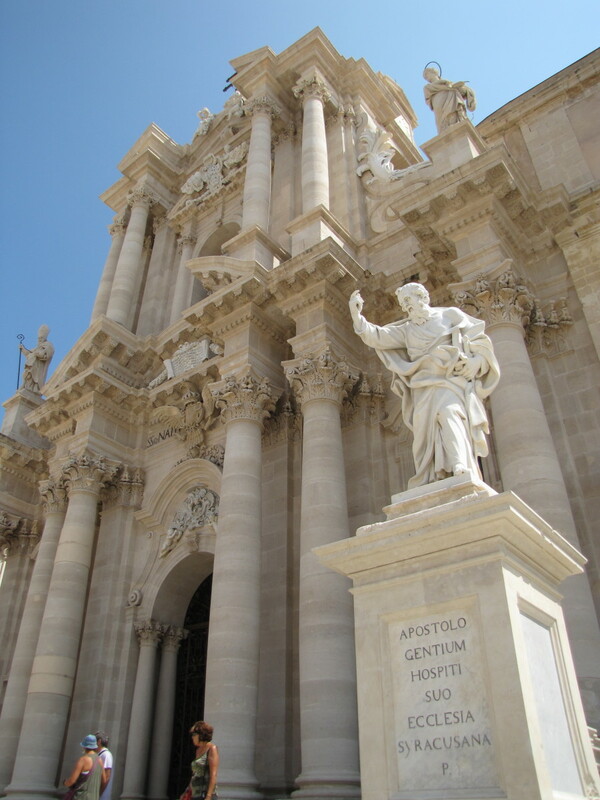 The site upon which the church sits dates back to the 14th century when an older Venetian church once stood here. During the time when the Ottomans ruled Crete the church was actually converted into a soap factory. In the 1860’s the current church was constructed here with its Baroque architecture and three-aisle interior. Damaged during World War II by the German bombing of Chania the church has been restored to its original condition and today is a major destination for visitors. The Cathedral sits prominently on Chalidon Street, the main road through the Old Town that leads to the harbor and is right across the street from the Archaeological Museum of Chania. This small, beautiful mosque is located in the heart of Chania in Eleftherios Venizelos Square right on the waterfront. As you walk the harbor it is hard to miss and it is certainly worth a peek inside. 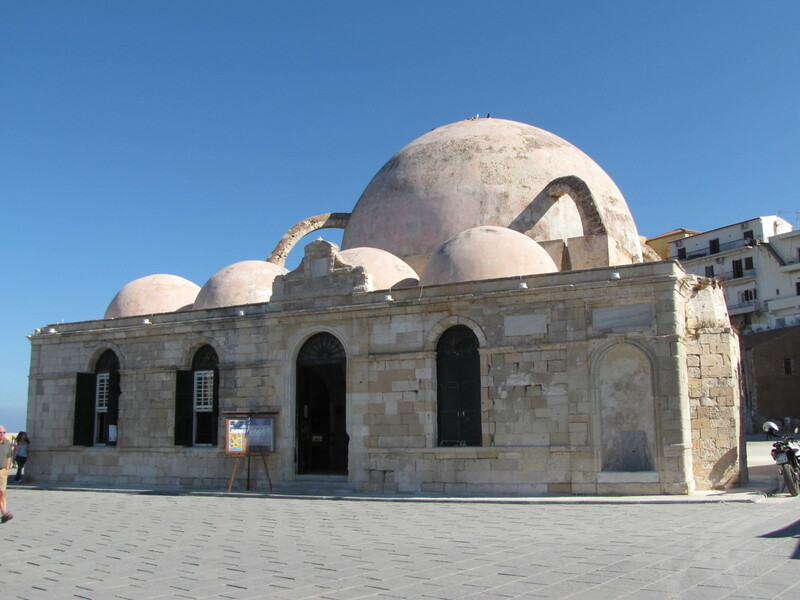 This was the first mosque that was built on Crete after the Ottoman conquest in 1649. The mosque is unique in that it has no minaret but has six small domes. A minaret was part of the original mosque but it was destroyed in the early 20th century. Today, visitors can enter the mosque to look around and it used primarily for art and civic exhibitions. 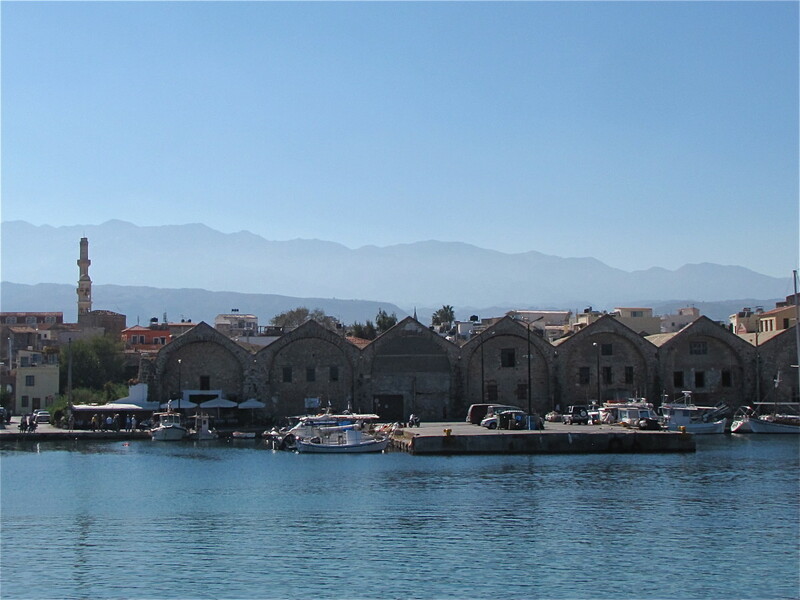 The Arsenals of Chania are the old Venetian shipyards from the 15th century. These high arched buildings were where the Venetian merchant fleet was built and maintained. There are nine of these long, narrow buildings remaining from the original twenty three and they now serve in a variety of roles. Some are simply used for storage while others are used for exhibits and conference halls. One contains a replica of a Minoan Ship that was actually rowed to Athens for the Summer Olympics in 2004. We had hoped to see the ship but the building was locked up while we were there. The Arsenal pictured here below was converted into a café and we couldn’t resist stopping for break. As you walk the waterfront by the arsenals you eventually come to the end of the line so to speak. If you are up for a little adventure you can hop onto the breakwater and walk out to the Venetian Lighthouse. Built in 1570 the lighthouse is no longer operational but is one of the most distinctive and photographed structures in Chania. About halfway out to the lighthouse you will pass a small building that was once a bastion and the remains of a tiny chapel. 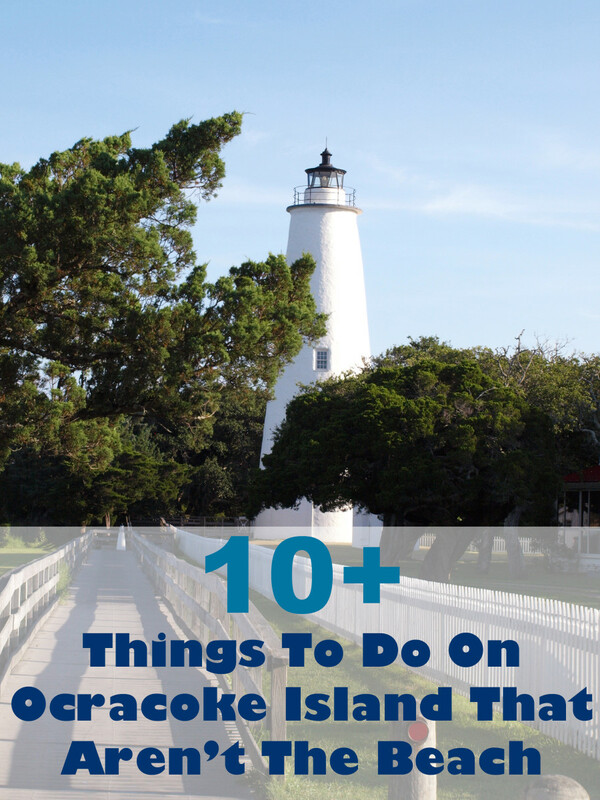 As you carefully walk out to the lighthouse, there are sections that are a little difficult, so watch your step. Also, be sure to notice the view across the harbor of Chania with the mountains in the distance. I’m a sucker for a great view so the effort was well worth it to me and provided a unique perspective of Chania. The Archaeological Museum of Chania was established in 1962 and is housed in a former Venetian Monastery. The museum is located across the street from the Cathedral of Chania and contains a number of exhibits from the Minoan and Roman periods. The museum has mosaics, pottery, sculptures, jewelry, coins and numerous other artifacts excavated from around the island of Crete. The museum is open daily except Mondays, until 3 pm and cost just two euro to visit. 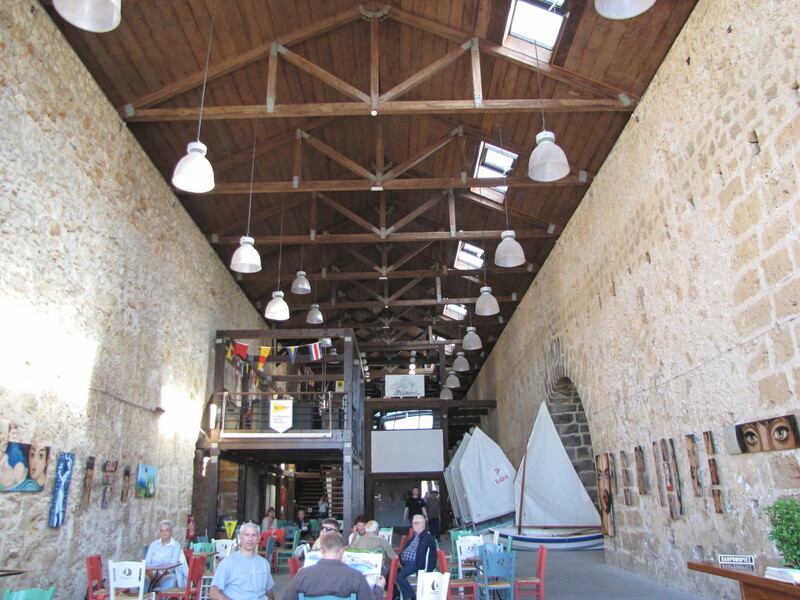 Housed inside Fort Firkas, the Nautical Museum of Crete contains an array of artifacts that commemorate the history of Crete from the time of the Venetians to World War II. There are historical photographs, a maritime library, models of ships, and a section dedicated to the German invasion of Crete during World War II. 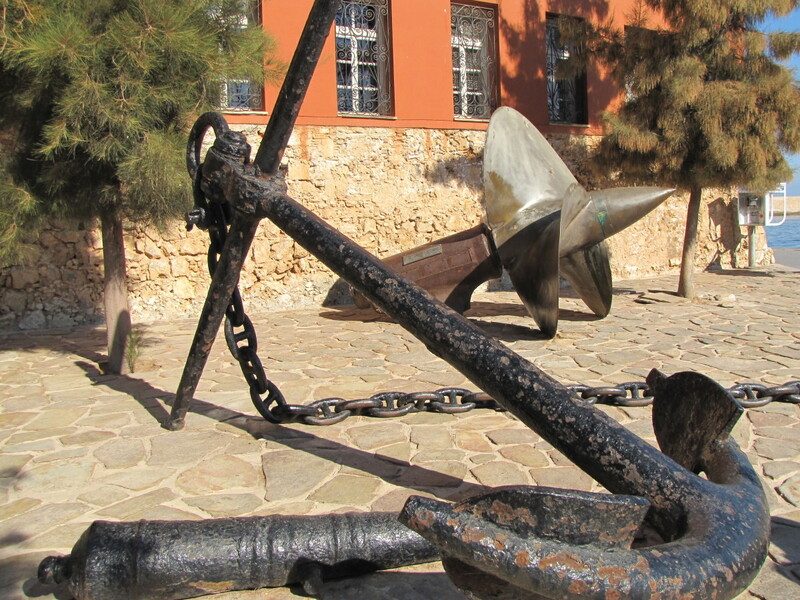 The museum is easy to find, just look for the huge anchor in front of the building along the waterfront. Old Chania really is a beautiful town and a walk along the waterfront is the best way to experience the color and beauty of this community. The harbor here is well protected by the breakwater that provides an adventurous path out to the lighthouse. 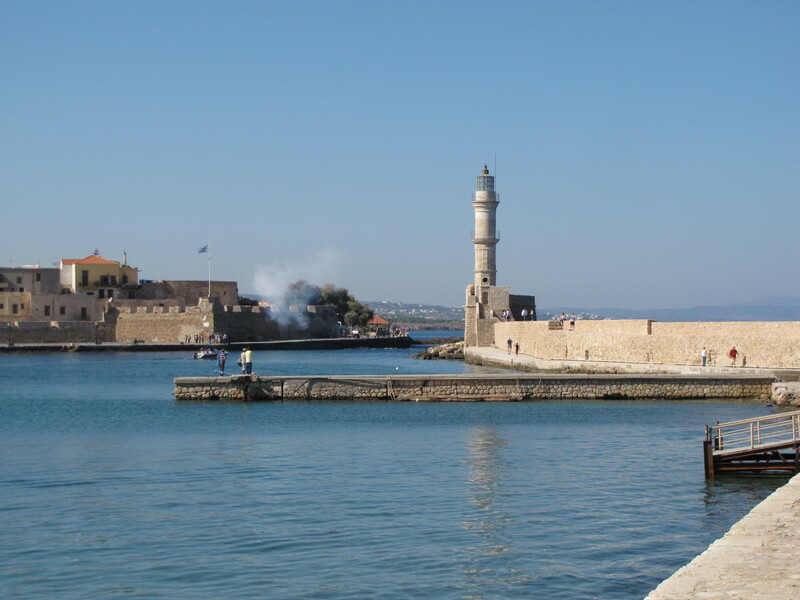 Walking the waterfront will take you by most of Chania's highlights including the Hassan Mosque, the Venetian Arsenals and Fort Firkas. It provides the best views of Chania and will give you plenty of photo opportunities. There are also plenty of shops and cafes along the waterfront when you need a break so it really has something for everyone. Fort Firkas was constructed during the Venetian period on Crete as a means of protection against the expansion of the Ottoman Empire. The fort sits right at the harbor entrance and still has the six arched openings where cannons once stood facing out over the Mediterranean. 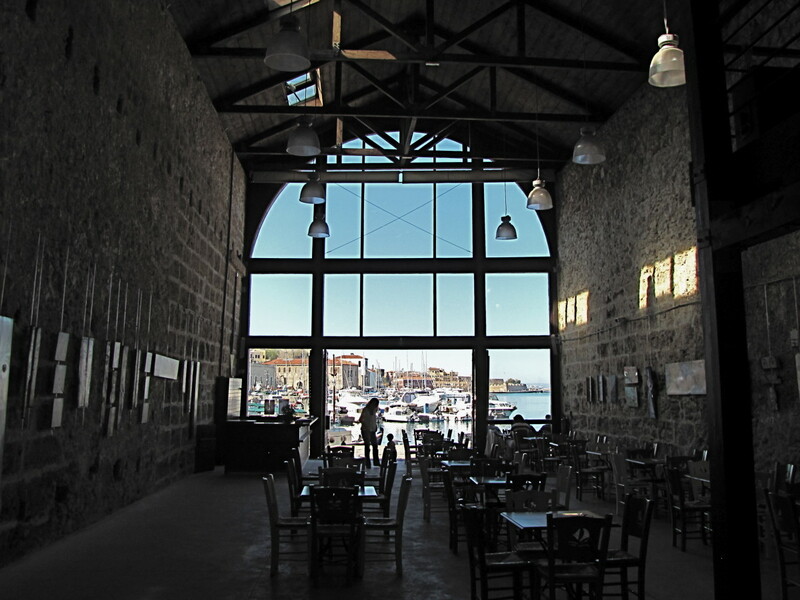 The fort also houses the Maritime Museum and is an important piece of the history of Chania. Over the centuries Fort Firkas served many roles including being used as a prison in addition to its role as a military fortress. On the day of our visit the Public Market in Chania was closed due to a parade commemorating Greece’s involvement in WWII. If you have time a walk through the Public Market seems like it would be an interesting thing to do and we were disappointed that it was closed while we were there. The market is located in a large building in the shape of a cross and you can find everything here including seafood, cheese, meats, vegetables, souvenirs, flowers and pretty much anything else you might be looking for. The building itself is very impressive and is located right next to the Public Gardens should you want to relax in a quiet, shady spot. 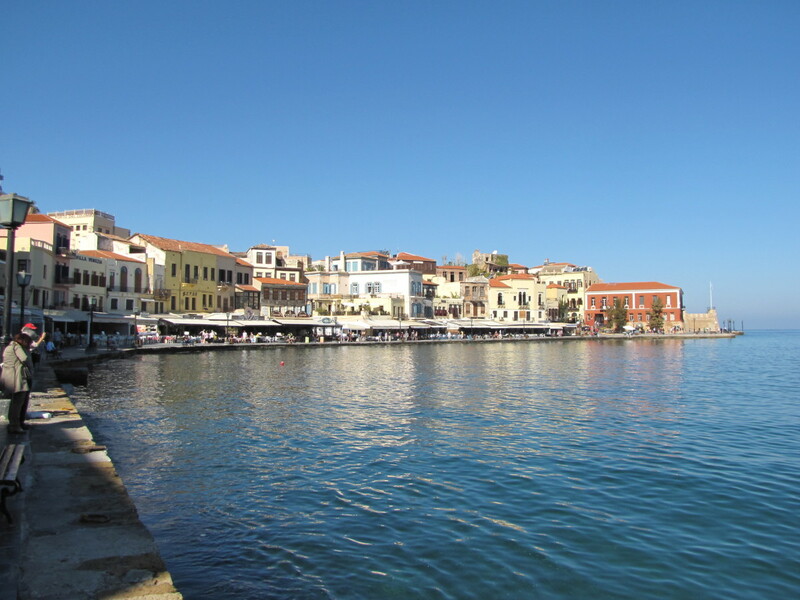 I hope you enjoyed this look at beautiful Chania, another gem in the eastern Mediterranean. Whether you are visiting Crete for an extended holiday or just stopping for the day as part of a cruise I think you'll enjoy the color, history and sheer beauty of Chania. Hi. Thanks for stopping by. Yes, I did make it out to the lighthouse. Great views of Chania with the mountains in the distance. We had a great day visiting this beautiful place. Have a great day. Hi Nell. You've been to some wonderful places yourself. Glad you enjoyed Chania. 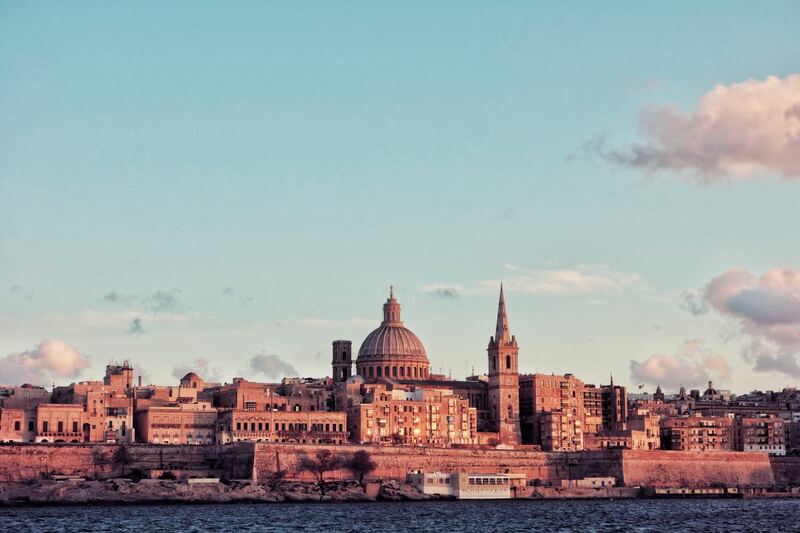 We really love this entire region of the Mediterranean and look forward to returning someday. Until then we can only dream :). Thanks for stopping by, have a wonderful weekend. What a lovely hub! I have never visited Crete, I really must one of these days, I have been to Kos, Corfu and Cyprus, so I could soak up the atmosphere once again reading this, ah bliss! lol! I'm back to say congratulations for being in the Top 10 for the HubPot Challenge! Well done! Hi CMHypno. Thank you, glad you enjoyed the visit to Chania. Crete is very large so one could spend quite a bit of time exploring the entire island. With limited time I would definitely include Chania for its history, culture and beautiful waterfront. Thanks for the visit, have a great day. Hi Tom, thanks for stopping by. I have not yet visited the southeast corner of Crete so I can't compare the two areas. I would imagine that the diving and sailing is quite good around most of Crete. The history and culture in Chania was very interesting and I look forward to returning to Crete to explore the rest of the island. Lovely hub. Crete is one of the Greek islands that I have not yet visited, so thank you for the great information and lovely pictures. Chania is now on my short-list for where to go this summer! Interesting travel destination. Although I've never visited the island of Crete, I have read about this place many times and it has always peaked my curiosity - especially for diving, sailing, seafood, and of course the culture. How does the southeast corner of the island differ from Chania? Thank you Linda. Glad you enjoyed Chania. I was not familiar with Chania prior to planning this cruise but it was a very pleasant surprise. Like other Mediterranean islands there was so much history there and the waterfront was beautiful. Thanks for the share, have a great Sunday. Hi Bill. You bet. When I visit these places I literally and figuratively get lost in the moment. The history and architecture of these areas is just incredible. Have a wonderful day also. This is a lovely and fascinating travel hub, as always, Bill. Every time I read one of your hubs I want to go where you have been! Your descriptions and photos are always so interesting. I'll share this hub. 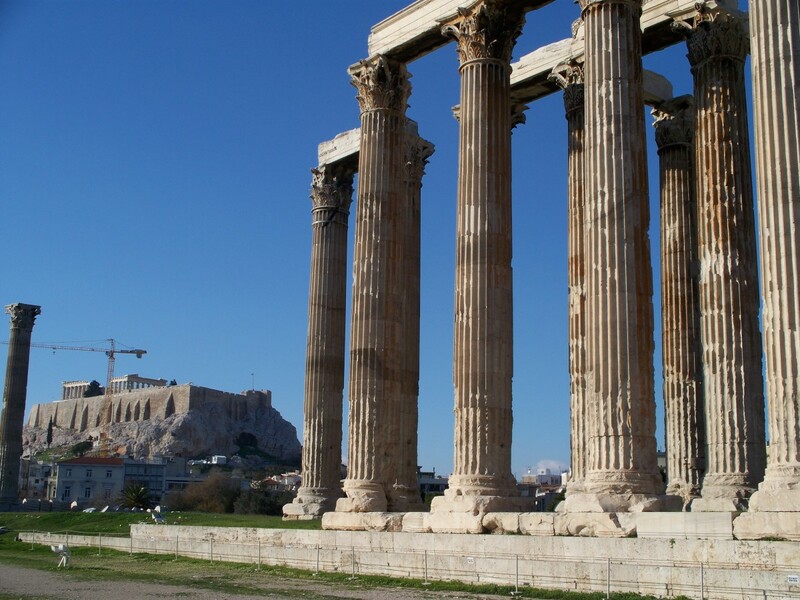 Can you just feel the history all around you while you are walking? I sure would. What a beautiful area; what incredible architecture. What a wonderful article. Well done, Bill! Now have yourself a great Sunday! Thank you Stephanie. We really enjoyed our day in Chania. It was both beautiful and historic. Glad you enjoyed the tour, thanks for the vote, etc... Have a great day. Thank you Flourish. I have been very blessed to have had the travel opportunities that I've had. I still get very excited wherever we travel somewhere new. Glad you enjoyed the trip to Chania, Crete. Thanks for the vote, pin, etc. Enjoy the rest of the weekend. 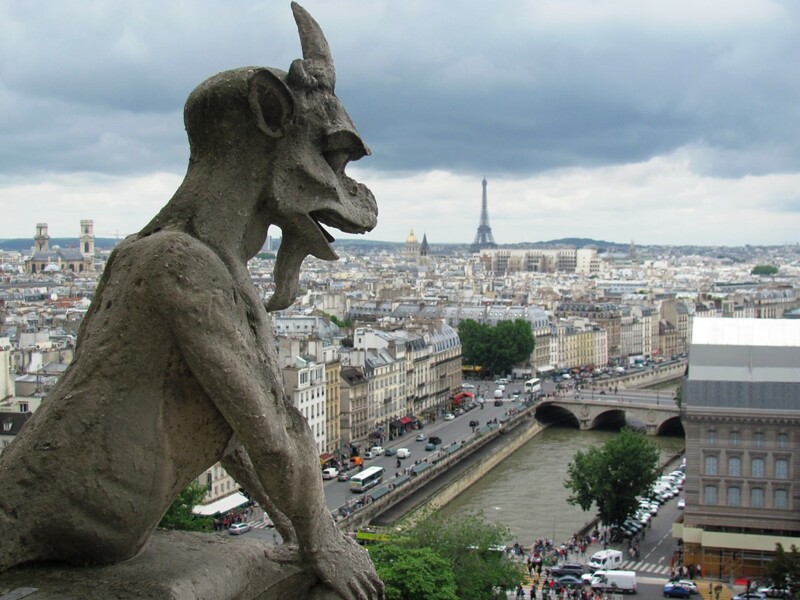 Bill, you visit some of the most fabulous places and make us all want to visit them. I enjoyed this very much. Voted up and more, plus pinning.